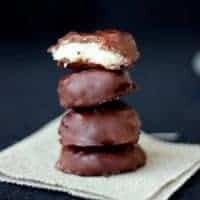 Homemade Paleo Peppermint Patties. So EASY to make and refined-sugar-free. Perfect for gift giving! In a food processor, process the shredded coconut about 30 seconds until it is very fine. Add the coconut milk, coconut oil, honey and peppermint extract. Process until about 30 seconds until a smooth paste has formed. Shape the paste into about 1 1/2 inch size rounds and place on a cookie sheet. Place the rounds in the freezer for 10 minutes. Melt the chocolate in the microwave on medium power or over a double boiler. Remove the shaped patties from the freezer and coat in chocolate. Allow the chocolate to cool and harden before serving. Enjoy!